Superb from start to finish. Pilot was friendly and the flight was excellent. Views at night were spectacular of the lit up strip. Could not fault at all. It was only a couple of minutes. 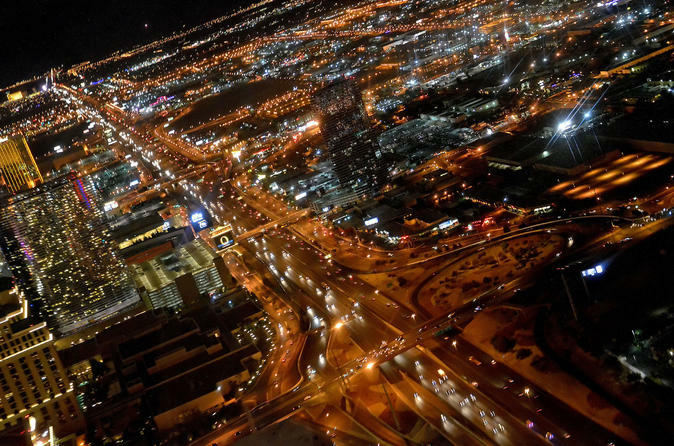 There is nothing interesting about the strip from above. It was not worth the money. The night helicopter flight was an amazing experience! I was getting out of a show and then doing this so the company actually picked me up from the place where the show was; great service with the company from start to finish. The flight goes past the strip and then back so you get to see it 2 times. I would use this company again, everyone was amazing and great customer service! We did the night time flight over strip. It was for my son’s birthday. It is a very nice flight. I loved it! Was a quick flight but top notch service. Pick up from hotel was right on time in a nice limo van. Champagne upon arrival before the flight. Pilot was great and the scenery of the strip at night was fantastic. Such a good deal for a nice way to spend an evening in Las Vegas and get above the hassle of the strip! 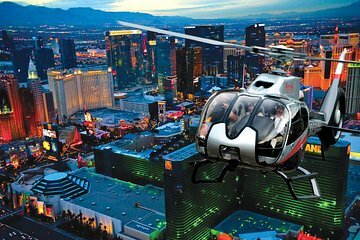 A beautiful way to see the Las Vegas strip and all of the amazing lights at night.